It goes without saying that a successful website uses its traffic well. Driving a lot of web traffic to your site is only one part of the battle. Once you’ve got people on your pages, it becomes your mission to convert them. Converting your traffic essentially means that you take an individual and convince them to act in a certain way on your site. The most obvious example of this - and one many of you will be keen to do - is to convince your traffic to become paying customers. They land on your site, and by the time they leave, they’ve made a purchase. This brings us to the central question; how do you build one of these forms for your website? An excellent opt-in form will help you generate leads, which could potentially create new customers further down the line, and establish a loyal customer base. The secret is developing a form that attracts the attention of your web traffic and encourages them to fill in their details. So, how do you do it? Take a look at our guide below, and you’ll soon learn all the steps involved. The first step will pretty much set the wheels in motion for everything that comes afterward. Before you start getting into the nitty-gritty of an opt-in form, you need to consider what happens when people fill the form in. How are you going to store and manage their details and then send out emails to your mailing list? In reality, the only way to do this is by finding an email list management provider. There are plenty out there like Mailchimp and Aweber, but we recommend SendGrid as it’s one of the most trustworthy ones out there, and is used by big brands around the world like Spotify and Uber. You’ll need to create a SendGrid account, and then there are simple instructions to follow that will help you create a new mailing list. Whenever you create a new list, it will be given a SendGrid List ID - which will become important as we progress through the steps here. There are so many features here that let you completely customize your lists by their gender, age, or whatever you want. We won’t go into too much detail here as it takes us on a little tangent. For now, all you need to know is that an email list management provider is essential for creating an opt-in form. Once you’ve got an email management system in place, you can go ahead and build the opt-in form for your website. The good news here is that you don’t need to physically create the form from scratch. You don’t need to have a grasp of coding here either, all you really need to focus on is finding a widget of sorts to help you. Here at Leader Internet, we’ve recently developed the SG Widget, which is basically a drag and drop form you can use to collect email addresses on your website. It’s specially created to be integrated with SendGrid marketing campaigns, which means you can easily link the widget by entering your SendGrid List ID. This will mean that anyone who fills in the form will automatically be added to that particular mailing list. This gives a nice little opt-in form that’s linked to your email list management software and can help generate lots of leads. You may think at this point that all your work is done and you can sit back, relax, and watch your traffic convert. However, when building one of these forms, you have a lot of additional things to think about, which we’ll talk about below. Looks mean everything when it comes to websites in the 21st Century. People don’t stick around for long, and if they don’t like the look of a site, they’ll be gone. For this reason, you really need to ensure your opt-in form is visually appealing. Thankfully, our SG Widget can be completely customized and styled to suit your site design. This allows you to make it as nice as possible, which encourages more people to actually fill in the form. One of the worst things you can do - when building an opt-in form - is to have loads of fields for people to fill in. No one wants to spend a lot of time filling in some super long form on your website. Internet users have a short attention span, and they’ll never do something that actually requires them to think. Instead, keep the form short and sweet, with one or two fields to fill in. All you really need is the name of the user and their email address. You can add them to your mailing list and start sending out regular emails. The lack of fields aids the point above about the form being visually appealing too. Users will like the look of a form with one or two boxes to fill in and be more likely to do so. An opt-in form on its own will not generate a lot of leads at all. Think about it, if you simply downloaded our widget, and stuck it on your site, would people fill it in? No. Why? Because they’ve not been told what they get if they proceed to give you their email details. There needs to be at least one clear and obvious benefit of filling in an opt-in form on your website. This is pretty much the sole reason people will go ahead and give you their information. Naturally, the benefits you promise will depend on the type of website you run. There are endless benefits of e-commerce sites offering a percentage discount for people who sign-up to their mailing list. This encourages people to fill in the form because they know they’ll save money when they make a purchase in the future. A lot of bloggers promise things like free ebooks to people that sign-up, or exclusive content that’s emailed to them. Essentially, the secret is ensuring you promise people something they won’t receive unless they opt-in and give you their email. It needs to be somewhat exciting, and they should feel as though they’re missing out if they don’t sign-up. 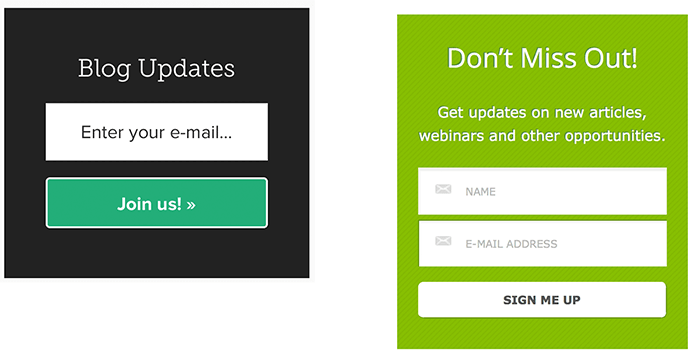 Every opt-in form needs to be built with a prominent call-to-action button that stands out from the rest of the form. The reasoning behind this is that the button helps grab people’s attention, which can lead to more clicks and more people opting in. When it comes to the design of this button, you have a couple of things to think about. For one, the color of the button matters. Ideally, you should pick a button color that stands out from the rest of the form design. So, if your form is primarily green, then use a color that juxtaposes this, such as red. Secondly, the text on the button matters a lot too. It needs to present a clear call-to-action for users on your page. This can be something simple like ‘Sign Up Today!’ or ‘Opt-in Now!’. Both of these examples tell the user what to do, and will lead to more clicks. Not only that, but you could also include a line of text under the main call-to-action, which helps convince people to click the button even more. One of the best examples of this is to press forward the point that signing up is entirely free. A little line like ‘It’s completely free!’ will go a long way to convincing someone to fill in the form and click that big button. So, to summarize things for you; an opt-in form is an essential part of every website. It helps convert your web traffic and generate leads, which helps make your site more functional and useful. The easiest way to create one is by using our new sign-up widget. To do this, you should create a SendGrid account to link mailing lists to this widget. Then, edit your form by making it visually appealing, easy for people to fill in, and convey a clear call-to-action. But, most of all, make sure the benefits of filling in your form are there for all to see! When you’ve nailed all of this, you will have a nice opt-in form on your site that generates loads of leads every day. We hope you found this article useful. If you have any comments, let us know in the section below.